Welcome back for the last day of Lawn Fawn April Inspiration Week, today we are focusing on the great mini set Stay Tuned. I really do love the images in this set and they are great for making those hard to create masculine cards. 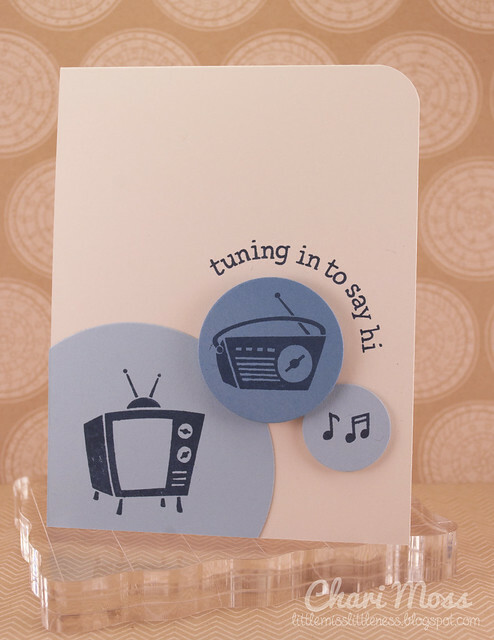 For my card I cut circles out of shades of blue cardstock and stamped the images in Jenni Bowlin Spice Tin ink. I arranged them and adhered them down with varying heights of adhesive. I finished the card off with a curved sentiment & rounded corner. Be sure you check out what the rest of the design team created on the Lawn Fawn Blog, and as always I hear there are inspiration week giveaways! Very cute - I love the images in the circles!!! Oh wow! I love what you've done with the circles! So clever! Perfect for a boy, indeed! I really love it simplicity, the design is amazing! So cute! I love the clean and simple look!